SOLDOTNA — On the second day of its worksession in Soldotna on Wednesday, the Board of Fisheries discussed a number of agenda change requests, or ACRs — requests for fisheries regulations submitted outside the regular cycles — to take up at its upcoming meetings this winter. The ACRs addressed issues around the state, not just the fisheries that have their regular cycles this winter. The Board of Fisheries chose not to take up an agenda change request related to limiting the size of boats in the Kenai River personal-use dipnet fishery in this cycle. Three of the 12 ACRs submitted would affect Cook Inlet fisheries, and only one was accepted. ACR 1, which would align regulations for sportfishing services and sportfishing guide services in saltwater with those in statute and update freshwater guide registration and reporting regulations, was accepted and applies statewide. The proposal came up because of a bill passed by the Legislature in 2015, HB 41, which re-establishes the licensing and logbook program for guides around the state and updates the logbook reporting requirements and fees. For the 2017 season, the Alaska Department of Fish and Game’s registration requirements are out of alignment with the law. The Board of Fisheries moved to accept the request because it meets the criteria for an unforeseen consequence of regulation, in this case, from the state. The Legislature has made efforts to update these laws over the years, and this law is a first step, said Reed Morisky, a member of the Board of Fisheries. “It’s got a long, long history, and the Legislature has done various fixes over the years, but there’s still effort in the Legislature to have a longer term solution with this, and I believe that by passing this ACR, we will be headed in that direction,” Morisky said. Accepting the ACR doesn’t mean the regulations will change — it only means the board will discuss it as a formal proposal at a meeting. Newly elected board chairman John Jensen suggested taking it up at the Lower Cook Inlet meeting in Homer, scheduled for the end of November, in order to get the regulations in place by January. Since HB 41 has a sunset date built into it, anything the board passes should also have a sunset date built in, Morisky said. The board declined to take up two Cook Inlet-specific ACRs, one that would have limited the types of boats to be used in the Kenai River personal-use dipnet fishery and the other to remove the net depth restriction for drift gillnet commercial fishing vessels in the Central District of Cook Inlet. 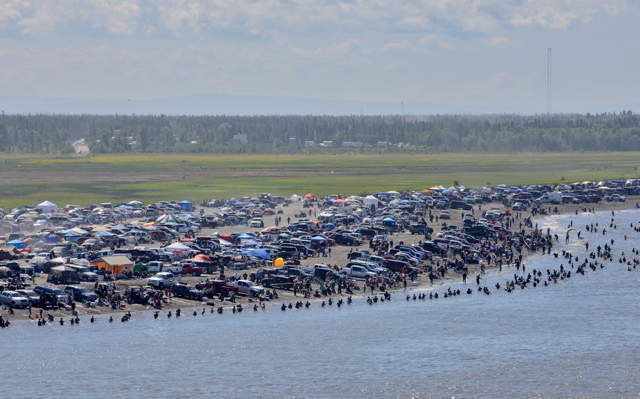 The first was proposed because of the number of boats that get swamped near the Kenai City Dock, where many boats of different sizes interact. At least five private boats were swamped this summer, with some needing assistance from the Kenai Fire Department boat that patrols those waters. Several board members said the public safety concerns about the personal-use fishery were legitimate, but the ACR did not meet the criteria to be accepted past the deadline for regular proposals. Board member Sue Jeffrey said she would like to see it discussed and said she might consider a board-generated proposal to address the public safety concerns arising in that fishery. Morisky said he understood the public safety risk in the fishery but that a board-generated proposal would likely generate controversy. Board-generated proposals can come up during the regular Upper Cook Inlet meeting, which will be held in Anchorage at the end of February 2017, and do not require public comment before passing. Jeffrey said if the board does come up with its own proposal, the public will have a chance to weigh in on it. The board also denied the agenda change request to lengthen commercial fishing driftnets beyond 45 meshes. The board denied it unanimously, with several members saying it was essentially a late proposal and that the net-depth issue would come up in the regular meeting in February. Board member Orville Huntington said he was also concerned that lengthening nets could interfere with the migration of king salmon, which have been shown to swim deeper than other salmon species. The board did choose to take up one other ACR related to a subsistence harvest limit for sockeye salmon near Unalaska. The Unalaska/Dutch Harbor Fish and Game Advisory Committee asked the board to reduce the limit because of concerns for the fish stocks in a portion of the beach known as Front Beach. Fish and Game does not monitor the sockeye salmon escapement in that system, but the fact that the proposal came from the local advisory committee carried weight, several board members said. Board member Israel Payton said he would give it more credence because the local advisory committee was petitioning to reduce their own limits. The board recessed for the evening with two ACRs left to consider and will continue its work in Soldotna Thursday, discussing miscellaneous business and non-regulatory proposals.